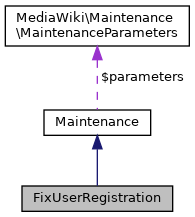 Maintenance script that fixes the user_registration field. Definition at line 32 of file fixUserRegistration.php. Definition at line 33 of file fixUserRegistration.php. Definition at line 39 of file fixUserRegistration.php. References $res, $user, as, DB_MASTER, Maintenance\getBatchSize(), Maintenance\getDB(), User\newFromId(), ActorMigration\newMigration(), null, Maintenance\output(), and wfWaitForSlaves().